The UNIVAC I (UNIVersal Automatic Computer I) was the first commercial computer produced in the United States. It was designed principally by J. Presper Eckert and John Mauchly, the inventors of the ENIAC. Design work was started by their company, Eckert–Mauchly Computer Corporation (EMCC), and was completed after the company had been acquired by Remington Rand (which later became part of Sperry, now Unisys). In the years before successor models of the UNIVAC I appeared, the machine was simply known as "the UNIVAC". The first Univac was accepted by the United States Census Bureau on March 31, 1951, and was dedicated on June 14 that year. The fifth machine (built for the U.S. Atomic Energy Commission) was used by CBS to predict the result of the 1952 presidential election. With a sample of just 1% of the voting population it famously predicted an Eisenhower landslide while the conventional wisdom favored Stevenson. Remington Rand employees, Harold E. Sweeney (left) and J. Presper Eckert (center) demonstrate the U.S. Census Bureau's UNIVAC for CBS reporter Walter Cronkite (right). The UNIVAC I was the first American computer designed at the outset for business and administrative use with fast execution of relatively simple arithmetic and data transport operations, as opposed to the complex numerical calculations required of scientific computers. As such, the UNIVAC competed directly against punch-card machines, though the UNIVAC originally could neither read nor punch cards. That shortcoming hindered sales to companies concerned about the high cost of manually converting large quantities of existing data stored on cards. This was corrected by adding offline card processing equipment, the UNIVAC Card to Tape converter and the UNIVAC Tape to Card converter, to transfer data between cards and UNIVAC magnetic tapes. However, the early market share of the UNIVAC I was lower than the Remington Rand Company wished. To promote sales, the company joined with CBS to have UNIVAC I predict the result of the 1952 Presidential election. UNIVAC I predicted Eisenhower would have a landslide victory over Adlai Stevenson whom the pollsters favored. The CBS crew was so certain that UNIVAC was wrong that they pretended it was not working. As the election continued and it became clear it was correct all along, the announcer admitted their sleight of hand and the machine became famous. The result was a greater public awareness of computing technology, and from then on computerized predictions were a must-have part of election night broadcasts. The first contracts were with government agencies such as the Census Bureau, the U.S. Air Force, and the U.S. Army Map Service. Contracts were also signed by the ACNielsen Company, and the Prudential Insurance Company. Following the sale of Eckert–Mauchly Computer Corporation to Remington Rand, due to the cost overruns on the project, Remington Rand convinced Nielsen and Prudential to cancel their contracts. The first sale, to the Census Bureau, was marked with a formal ceremony on March 31, 1951, at the Eckert–Mauchly Division's factory at 3747 Ridge Avenue, Philadelphia. The machine was not actually shipped until the following December, because, as the sole fully set-up model, it was needed for demonstration purposes, and the company was apprehensive about the difficulties of dismantling, transporting, and reassembling the delicate machine. As a result, the first installation was with the second computer, delivered to the Pentagon in June 1952. 1954 General Electric Appliance Division, Louisville, KY. First business sale. Originally priced at US$159,000, the UNIVAC I rose in price until they were between $1,250,000 and $1,500,000. A total of 46 systems were eventually built and delivered. The UNIVAC I was too expensive for most universities, and Sperry Rand, unlike companies such as IBM, was not strong enough financially to afford to give many away. However, Sperry Rand donated UNIVAC I systems to Harvard University (1956), the University of Pennsylvania (1957), and Case Institute of Technology in Cleveland, Ohio (1957); the UNIVAC I at Case was still operable in 1965 but had been supplanted by a UNIVAC 1107. A few UNIVAC I systems stayed in service long after they were made obsolete by advancing technology. The Census Bureau used its two systems until 1963, amounting to 12 and nine years of service, respectively. Sperry Rand itself used two systems in Buffalo, New York until 1968. The insurance company Life and Casualty of Tennessee used its system until 1970, totaling over 13 years of service. UNIVAC I used about 5,000 vacuum tubes, weighed 16,686 pounds (8.3 short tons; 7.6 t), consumed 125 kW, and could perform about 1,905 operations per second running on a 2.25 MHz clock. The Central Complex alone (i.e. the processor and memory unit) was 4.3 m by 2.4 m by 2.6 m high. The complete system occupied more than 35.5 m² (382 ft²) of floor space. The main memory consisted of 1000 words of 12 characters. When representing numbers, they were written as 11 decimal digits plus sign. The 1000 words of memory consisted of 100 channels of 10-word mercury delay line registers. The input/output buffers were 60 words each, consisting of 12 channels of 10-word mercury delay line registers. There are six channels of 10-word mercury delay line registers as spares. With modified circuitry, seven more channels control the temperature of the seven mercury tanks, and one more channel is used for the 10 word "Y" register. The total of 126 mercury channels is contained in the seven mercury tanks mounted on the backs of sections MT, MV, MX, NT, NV, NX, and GV. Each mercury tank is divided into 18 mercury channels. A channel in a column of mercury, with receiving and transmitting quartz piezo-electric crystals mounted at opposite ends. An intermediate frequency chassis, connected to the receiving crystal, containing amplifiers, detector, and compensating delay, mounted on the shell of the mercury tank. A recirculation chassis, containing cathode follower, pulse former and retimer, modulator, which drives the transmitting crystal, and input, clear, and memory-switch gates, mounted in the sections adjacent to the mercury tanks. Besides the operator's console, the only I/O devices connected to the UNIVAC I were up to 10 UNISERVO tape drives, a Remington Standard electric typewriter and a Tektronix oscilloscope. The UNISERVO was the first commercial computer tape drive commercially sold. It used data density 128 bits per inch (with real transfer rate 7,200 characters per second) on magnetically plated phosphor bronze tapes. The UNISERVO could also read and write UNITYPER created tapes at 20 bits per inch. The UNITYPER was an offline typewriter to tape device, used by programmers and for minor data editing. Backward and forward tape read and write operations were possible on the UNIVAC and were fully overlapped with instruction execution, permitting high system throughput in typical sort/merge data processing applications. Large volumes of data could be submitted as input via magnetic tapes created on offline card to tape system and made as output via a separate offline tape to printer system. The operators console had three columns of decimal coded switches that allowed any of the 1000 memory locations to be displayed on the oscilloscope. Since the mercury delay line memory stored bits in a serial format, a programmer or operator could monitor any memory location continuously and with sufficient patience, decode its contents as displayed on the scope. The on-line typewriter was typically used for announcing program breakpoints, checkpoints, and for memory dumps. A typical UNIVAC I installation had several ancillary devices. There were, typically: a printer that read a magnetic tape and printed output on continuous-form paper; a card-to-tape converter, that read punched cards and recorded their images on magnetic tape; and a tape-to-card converter, that read a magnetic tape and produced punched cards. There was no UNIVAC provided operating system. Operators loaded on a UNISERVO a program tape which could be loaded automatically by processor logic. The appropriate source and output data tapes would be mounted and the program started. Results tapes then went to the offline printer or typically for data processing into short term storage to be updated with the next set of data produced on the offline card to tape unit. The mercury delay line memory tank temperature was very closely controlled as the speed of sound in mercury varies with temperature. In the event of a power failure, many hours could elapse before the temperature stabilized. Eckert and Mauchly were uncertain about the reliability of digital logic circuits and little was known at the time. The UNIVAC I was designed with parallel computation circuits and result comparison. In practice, only failing components yielded comparison faults as their circuit designs were very reliable. Tricks were used to manage the reliability of tubes. Prior to use in the machine, large lots of the predominant tube type 25L6 were burned in and carefully tested. Often half of a production lot would be thrown away. Technicians installed a tested and burned-in tube in an easily diagnosed location such as the memory recirculate amplifiers. Then, when aged further, this "golden" tube was sent to stock to be used in a difficult to diagnose logic position. It took about 30 minutes to turn on the computer as all filament power supplies were stepped up to operating value over that time, to reduce in-rush current and thermal stress on the tubes. As a result, uptimes (MTBF) of many days to weeks were obtained on the processor. The UNISERVO did not have vacuum columns but springs and strings to buffer tape from the reels to the capstan. These were a frequent source of failures. Wikimedia Commons has media related to UNIVAC I. ^ The first commercial computer in the world was the BINAC built by the Eckert–Mauchly Computer Corporation and delivered to Northrop Aircraft Company in 1949. ^ Reference: CNN's feature on the 50th anniversary of the UNIVAC. ^ Norberg, Arthur Lawrence (2005). Computers and Commerce: A Study of Technology and Management at Eckert-Mauchly Computer Company, Engineering Research Associates, and Remington Rand, 1946-1957. MIT Press. pp. 190, 217. ISBN 9780262140904. ^ Lukoff, Herman (1979). From Dits to Bits: A personal history of the electronic computer. Portland, Oregon, USA: Robotics Press. pp. 127–131. ISBN 0-89661-002-0. LCCN 79-90567. ^ Brinkley, Alan. American History: A Survey. 12th Ed. ^ UNIVAC conference, Charles Babbage Institute, University of Minnesota. 171-page transcript of oral history with computer pioneers involved with the Univac computer, held on 17–18 May 1990, Washington DC. The meeting involved 25 engineers, programmers, marketing representatives, and salesmen who were involved with the UNIVAC, as well as representatives from users such as General Electric, Arthur Andersen, and the U.S. Census. ^ Ceruzzi, Paul E. A history of modern computing, MIT, 1998. The source notes that the list is compiled from a number of sources and does not include UNIVACs that were completed not delivered in the period 1951–54. In some cases the dates are approximate. Depending on the definition of "installed" the order may be slightly different. ^ "Automatic Computing Machinery: News - UNIVAC Acceptance Tests". Mathematics of Computation. 5 (35): 176–177. 1951. doi:10.1090/S0025-5718-51-99425-2. ISSN 0025-5718. ^ "Automatic Computing Machinery: News - Eckert-Mauchly Division, Remington Rand Inc". Mathematics of Computation. 5 (36): 245. 1951. doi:10.1090/S0025-5718-51-99416-1. ISSN 0025-5718. ^ "Automatic Computing Machinery: News - UNIVAC Acceptance Tests". Mathematics of Computation. 6 (38): 119. 1952. doi:10.1090/S0025-5718-52-99400-3. ISSN 0025-5718. ^ "Automatic Computing Machinery: News - UNIVAC Acceptance Tests". Mathematics of Computation. 6 (40): 247. 1952. doi:10.1090/S0025-5718-52-99384-8. ISSN 0025-5718. ^ a b . Digital_Computer_Newsletter_V05N03_Jul53.pdf. "1. UNIVAC". Digital Computer Newsletter. 5 (3): 2. July 1953. ^ "THE UNIVAC". Digital Computer Newsletter. 6 (1): 2. Apr 1954. ^ "7. UNIVAC". Digital Computer Newsletter. 6 (3): 4–5. Jul 1954. ^ "2. The UNIVAC". Digital Computer Newsletter. 6 (2): 2. Jan 1954. ^ The vacuum tubes used in the UNIVAC I were mostly of type 25L6, but the machine also used tubes of type 6AK5, 7AK7, 6AU6, 6BE6, 6SN7, 6X5, 28D7, 807, 829B, 2050, 5545, 5651, 5687, 6AL5, 6AN5, 6AH6, 5V4, 5R4, 4D32, 3C23, and 8008. ^ Weik, Martin H. (March 1961). "UNIVAC I". ed-thelen.org. A Third Survey of Domestic Electronic Digital Computing Systems. UNIVAC Conference Oral history on 17–18 May 1990. Charles Babbage Institute, University of Minnesota, Minneapolis. 171-page transcript of oral history with computer pioneers, including Jean Bartik, involved with the Univac computer, held on 17–18 May 1990. The meeting involved 25 engineers, programmers, marketing representatives, and salesmen who were involved with the UNIVAC, as well as representatives from users such as General Electric, Arthur Andersen, and the U.S. Census. Margaret R. Fox Papers, 1935–1976, Charles Babbage Institute, University of Minnesota. 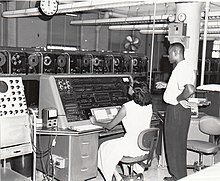 collection contains reports, including the original report on the ENIAC, UNIVAC, and many early in-house National Bureau of Standards (NBS) activity reports; memoranda on and histories of SEAC, SWAC, and DYSEAC; programming instructions for the UNIVAC, LARC, and MIDAC; patent evaluations and disclosures relevant to computers; system descriptions; speeches and articles written by Margaret Fox's colleagues; and correspondence of Samuel Alexander, Margaret Fox, and Samuel Williams.